Perched at the end of the Batumi Boulevard and right next the Alphabetic Tower, the Miracle Park derives its name from the surprisingly rapid completion of the park as a project. The Park hosts several concerts and events throughout the year; summers see a lot of electronic music festivals, while the New Year time in the winters has a gorgeous tree set up in the middle of the park. The park also accommodates other popular attractions of Batumi like the Statue of Love, the Light House and the Ferris Wheel. 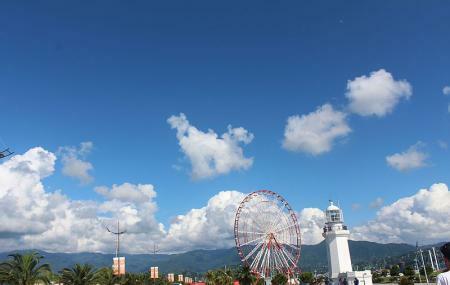 The Ferris Wheel is another great attraction of Batumi that offers breathtaking panoramic views of Batumi. Thus, it can be said that Miracle Park is home to most of the major Batumi attractions. Currently under some renovation, the park promises to come up with some even more exciting stuff to entertain tourists. As you stroll through the Batumi Boulevard, you can easily spot this gem at the end of the promenade, given its iconic structures. Perfect to spend an elegant evening. Enjoy an evening stroll at the Miracle Park, as you watch the sun fading into the Black Sea. On foot, bus or bicycle. How popular is Miracle Park? People normally club together Batumi Boulevard and The Neptune Fountain while planning their visit to Miracle Park.